Josef Hlavacek Heligonka Accordion (1925), made in Czechoslovakia, clear lacquer finish, walnut, leather, nickel, black hard shell case. 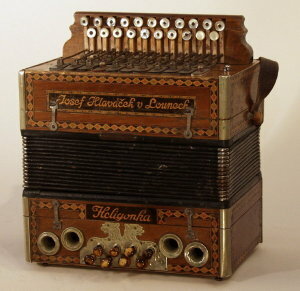 A rare two-row diatonic button accordion in C/F by the noted Slovak maker, Josef Hlavacek, who was based in Louny (now part of the Czech Republic). It has twenty-one melody buttons and eight "helikon" bass/chord buttons and is ornamented with intricate wood marquetry throughout. The top of the right hand melody side bears the legend "Josef Hlavacek V Lounech," inlaid in cursive, with a metal plaque below it which reads "Made in Czechoslovakia." On the bass side is the inscription "Heligonka" above a very nice decorative tinplate guard for the bass buttons, with an opposing lion-head motif stamped into it. The melody keys are wood levers in a wooden comb, finished with mother-of-pearl buttons, while the bass buttons appear to be hand-carved from horn. Height is 13 1/2 in. (34.3 cm. ), 12 in. (30.5 cm.) wide, and 8 1/4 in. (21 cm.) deep. Overall, this instrument is very weathered with a great deal of wear. There is no front grill; it was probably removed by the original owner, a common "nasty habit" among button-accordion "squeezers." The bellows are in good shape with no leaks and the reeds are also in very good condition and seem to be in tune. All the melody buttons work are fine except for the fourth one on the outside row which needs a new spring. The leather pads on all the melody button palettes need to be replaced. In need of restoration.